The AVPro Advanced Fundamentals training class, hosted by Christie Digital Kitchener, Ontario, is designed to keep attendees in front of their competition. The topics include Home Acoustics Alliance Audio Calibration, Imaging Science Foundation Video Calibration, and HDMI/HDBaseT Integration presented by Atlona. Attendees will spend 3 days in an interactive, hands-on learning environment surrounded by the latest in audio and video equipment and test gear. Day 1: Learn to apply basic audio calibration techniques, and how to apply this knowledge on the job in under 2 hours, saving time on the site while still providing superior audio integration. You will also be enveloped in HDBaseT video integration technology. Understanding and installing HDBaseT will be a focal point the second half of the day and carried through until the end of the class. The Workshop is a 1/2-day class which prepares the student to begin calibrating and understanding acoustics immediately. 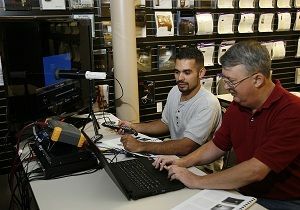 Enabled by the latest process driven instruction on their laptop, the calibrator in the field is led through the workflow collecting data and making adjustments. The service includes a detailed report documenting performance that in turn can be presented to the consumer. This is a high value service that enhances performance and adds profitability to every custom project. 1PM-5PM - HDBaseT Fundamentals - Installing distributed digital systems featuring Atlona Technologies. This course covers a range of topics designed to bring attendees up to speed on HDMI, EDID and HDCP -- how to integrate it and deploy it over distance at multiple points. Atlona Application Engineers will discuss HDBaseT and HDBaseT Lite for digital distribution, connectivity, and control of the digital stream including high definition audio, video, (including 4K Video and Lossless Audio) Control (RS232, IR, CED, USB), Ethernet and Power (PoE), and a primer on digital system troubleshooting. Day 2-3: Attendees will complete ISF certification training and be recognized as elite. Level II Certification signifies the top professionals in the world. Students will learn the most recent techniques in video calibration from the ISF founder Joel Silver. This training will be held at Christie Digital and lunches will be provided. The first part of this day is part lecture, part hands-on. Lab: After the lecture portion, attendees will spend the rest of the day using equipment to calibrate various display types, focusing on Black Level, White Level, and Gamma. Lab: Attendees will have more lab time using the gear to calibrate for color and using the CMS (Color Management System). The day will close with a brief discussion on emerging technology and a Q&A session.